Lekki has been relatively crime free in the past few months. However, two new crime incidents were recorded in Lekki recently. Firstly, the Lagos state police command arrested and paraded two men who specialize in robbery and dispossessing pedestrians on the Lekki-Epe expressway during traffic at night. 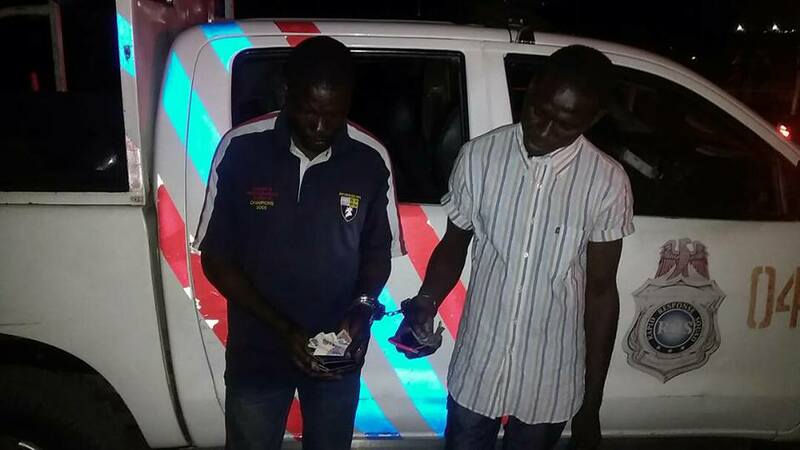 The men were arrested at 10PM in the Jakande area of the Lekki Epe expressway while robbing passerbys. Checkout their pictures below. There’s a viral video on social media allegedly showing a middle aged man driving a Benz come out of his car, remove his clothes and ran mad for almost 30 minutes.. Eye witness then says he quickly covered his nakedness after about 30-minutes and was reportedly later taken away by his friends in Lekki, Lagos who had brought him some clothes to put on. Please be careful out there and report any suspicious activity to the relevant authorities.